Top of the Wold adventure is the trek and tour company in Nepal for adventure tourism in high Himalayas . Top of the word Adventure, a registered travel agency holds glorious experience of operating varieties of tour and travel packages with premium service and quality that are typical to international standards. In fact, Top of the world adventure is a team of young and committed adventure and travel experts who organize quality service. 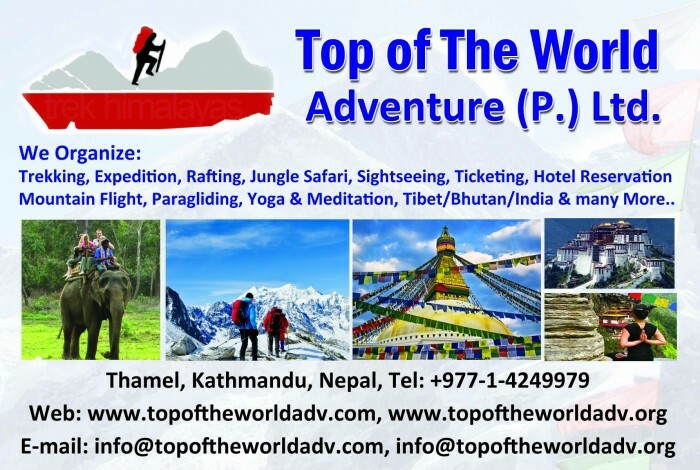 Top of the World Adventure is one of the largest privately owned travel management company with significant resources in Personal Vacation Travel Planning in Nepal. Here we have very beautiful snow capped mountains and also the Mount Everest “Top of the World”, which lies in the Nepal and center of attraction for all. Not only this we have various type of flora and fauna and we are specialized for trekking, Jungle safari, Sightseeing, Paragliding, Peak climbing, Pilgrimage Tour, Rafting packages, Heli–tour, Peak climbing, Bhutan tour, Mountain flight, Tibet tour, Mt. Kailas tour etc. We have strong support from adventure lover and our friends as well as well wishers. We know that, internet affords you infinite choices with regard to your travel plans. However, using a travel professional means that you have an advocate; someone who is accountable for the time and money you are investing. In the bunch of travel agencies striving with similar travel services, Blaze mountain adventures stand apart and unique when it comes to quality, transparency, safety, and care. Some reason to travel with our trekking company. Top of the world adventure has experienced, friendly guide and support staff to provide you a excellent service. Flexible service and packages, you can customize every package as per your desire and your holiday. Our business is not only for earning, we are doing social service and donating 10 percentage of our earning for needy people and to the education development program. We are trying to do our business a reasonable way. We are lunching Eco friendly package for sustainable tourism. We are doing transparent and fair business .Our travel export describe about our service and about your money where you spending.